Things have been pretty busy for me lately and I have a bit of a backlog of things to post about, so I thought I would throw a few different things together in a this and that update. For our do.good stitches bee blocks this month, Rachel asked us to make a large herringbone block using her tutorial. Well actually it was for December, but luckily we decided to take the month off in January and Rachel gave us an extra few weeks to get the blocks done, which was much appreciated when I was frantically finishing up my holiday gifts. I had fun making this block and really like the fun, bright scrappy patchwork look of the color scheme she had us use - it'll be fun to see the quilt come together! 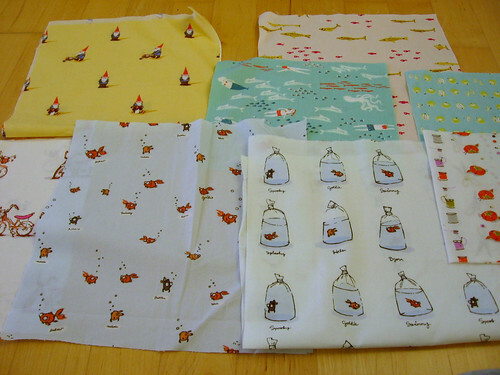 I was so thrilled to have won one of the giveaways on 2nd Avenue Studio for giveaway day (and happy to "meet" Rachel, who is a member of my guild here in Portland), and even more thrilled when this gorgeous package of Heather Ross fabrics came in the mail. 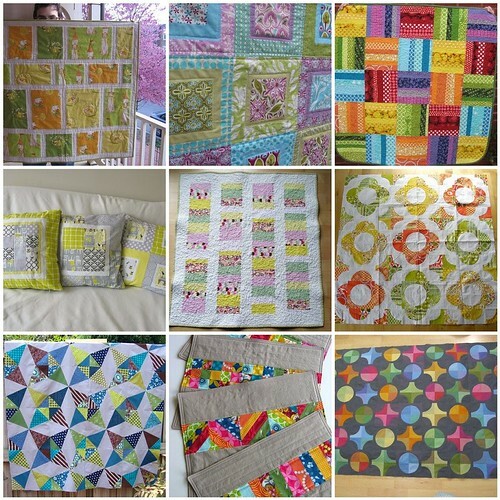 I love all the cute creations I have seen other folks make with her fabrics, but other than the quilt I made with Far Far Away 2 I haven't had any of them myself. I am looking forward to some fun fussycutting in the future to show off these cuties, although I am a bit scared to cut into them! Among many other fun craft-supply gifts that I got for the holidays (thank you friends and family, you know me well! 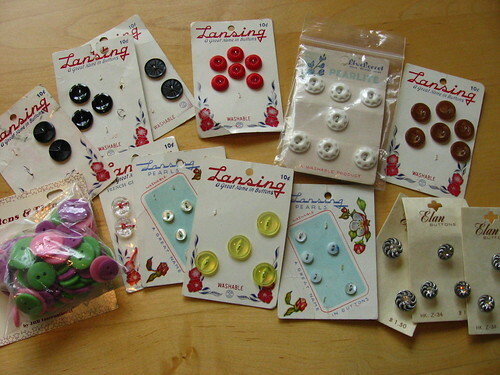 ), my mother-in-law gave me these fun vintage buttons. I am building up a bit of a button collection and love having a supply to use in future projects. 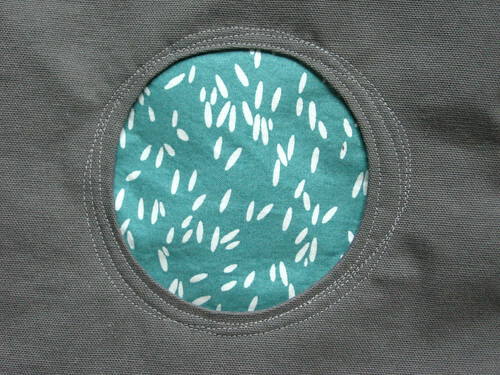 I took a t-shirt making class a few months ago (at local sewing studio, Modern Domestic) and have never gotten around to blogging about it here! 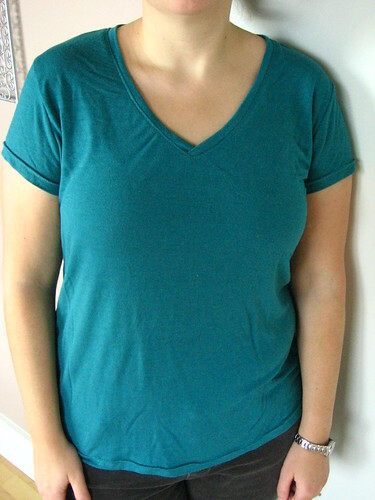 I thought it would be fun to take a class to learn more tips and tricks about sewing with knits, although I felt a bit silly when I got there and realized it wasn't really different from the kids t-shirts I had sewed earlier this year. 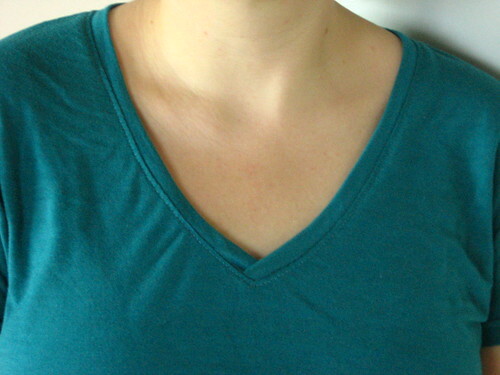 One cool new thing that I did learn was how to make a v-neck (they showed us how to use wash-away wonder tape to hold everything in place, although it was still a bit tricky to get it to turn out nice). I also got to try out the serger which was really fun, definitely makes me want to save up and get one! And somehow I had more trouble sewing the hems with a double needle on their fancy bernina than I have had when I have done it at home. I am really happy with how my t-shirt turned out, though, and look forward to making more! Now that all the holiday presents have been gifted, I can show off some of the things I have been working on! 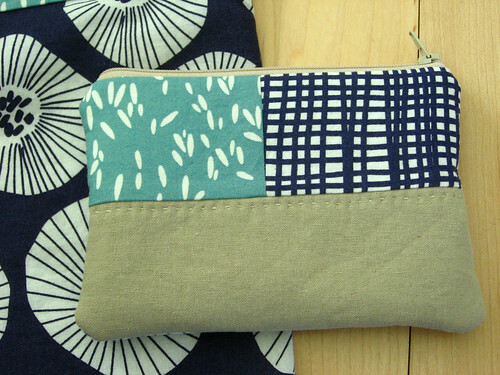 I ended up making nearly all my sewn holiday gifts with Lotta Jansdotter's fabric line, Echo, so I'm putting all of those gifts in this post and will come back and share the others after I finish up one last (totally late) gift. It's funny, when I first saw Echo I wasn't sure if I would get any - which is crazy, since I have several of Lotta's books and love her designs. 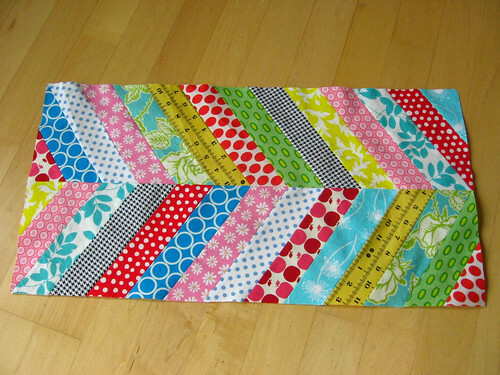 But I just wasn't sure it would play well with other fabrics and I didn't want to make a whole quilt out of it. 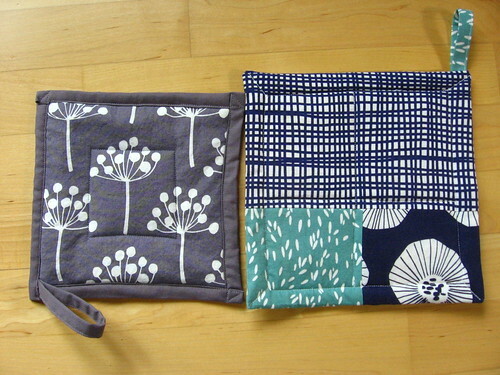 Then when I started thinking about making holiday gifts, I decided to use it to make a few gifts... and then realized that it would be great for a number of folks on my list and ended up going back to get more fabric! 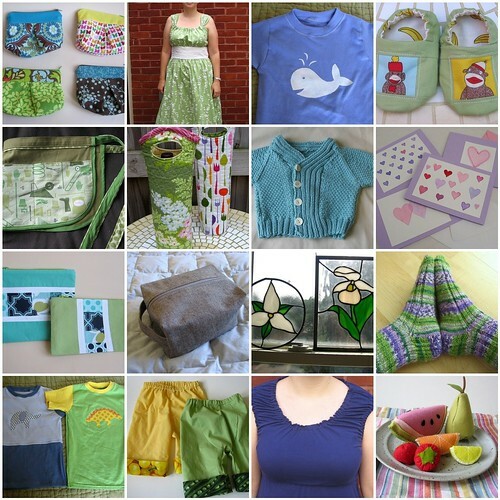 Getting to use a fabric that I loved made the last minute frantic holiday sewing still feel fun, and I think everyone really liked their gifts. 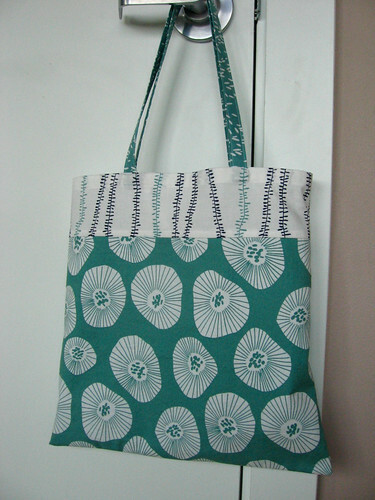 I made a couple totes using my easy tote bag tutorial - the one at the top was sized up quite a bit to make a more substantial bag, while the one above was the regular size. 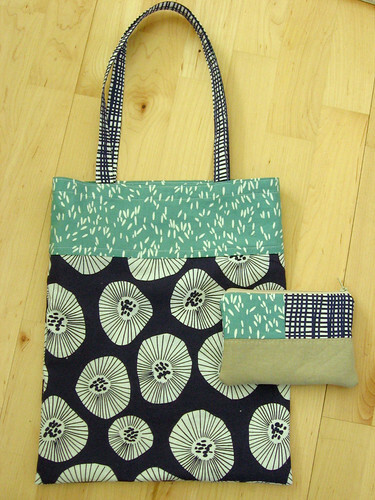 I also made a matching zip pouch to go with this tote, with some essex linen and a line of hand-stitching as an accent. 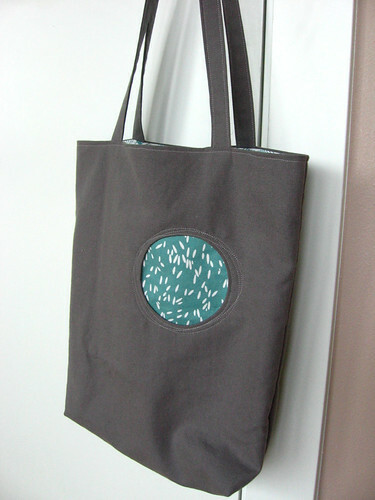 I think this tote bag with a reverse applique circle was my favorite sewn gift that I made - the idea of the circle with the off-kilter stitches was inspired by this bag on flickr. 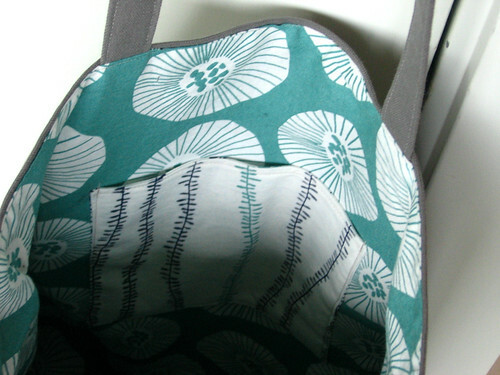 The inside is lined with another Echo print and has a pocket. 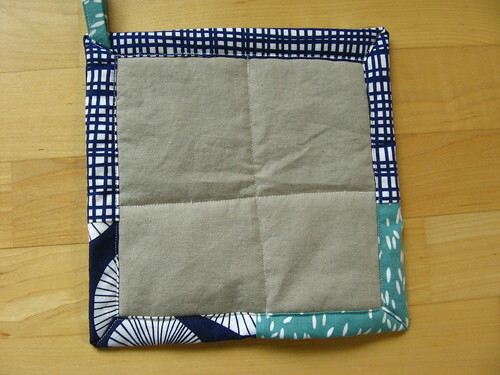 Finally, I made a couple potholders, using a cut up bath towel as the inner layer rather than batting - I made a whole slew of potholders as gifts five or six years ago and that was the method I came up with at the time, it makes a nice, well-insulated potholder although the terry sheds everywhere in the process. More essex linen on the back of this one. Luckily I still have a bit of Echo left so I can make myself a little something too!